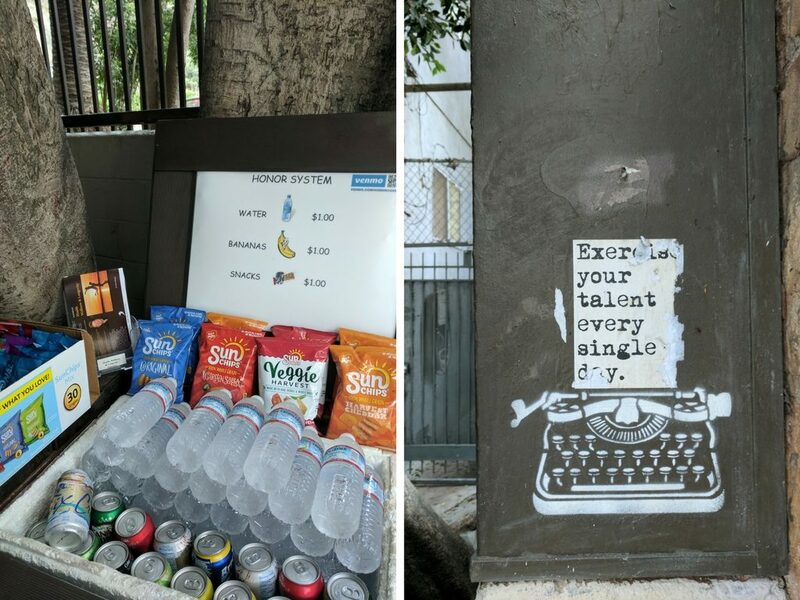 As we stood at the solid iron gates of the Runyon Canyon hiking trail, the excitement in the air was palpable. 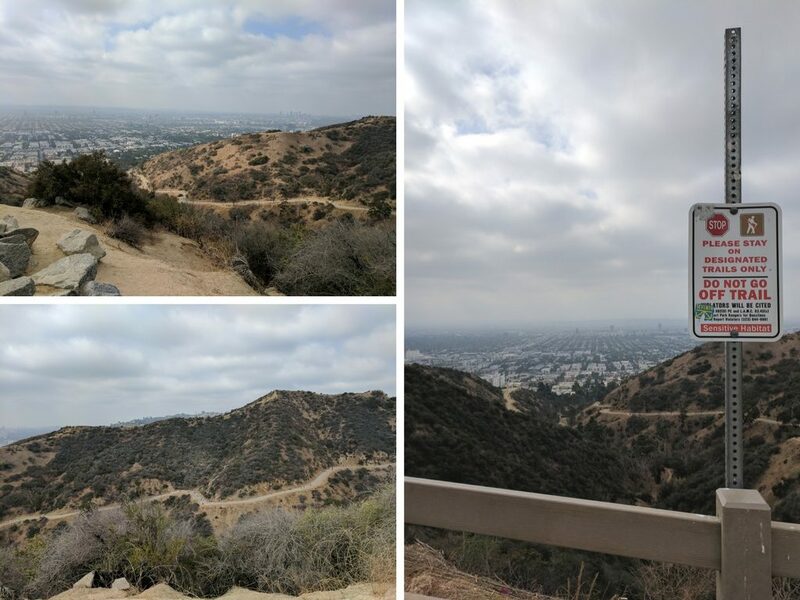 The 160-acre Runyon Canyon Park is popular with both tourists and LA locals, and has even been named one of the best places to see celebs – everyone from Amanda Seyfried to Justin Bieber and Orlando Bloom has at one point been spotted getting their workout on. But it’s not the Hollywood A Listers we’re here to see today. A van pulls up and other iron gate loiterers start gravitating hungrily towards it. Two people jump out of the van, the side doors swing open…and out fly a dozen eager dogs, ready for their morning exercise. 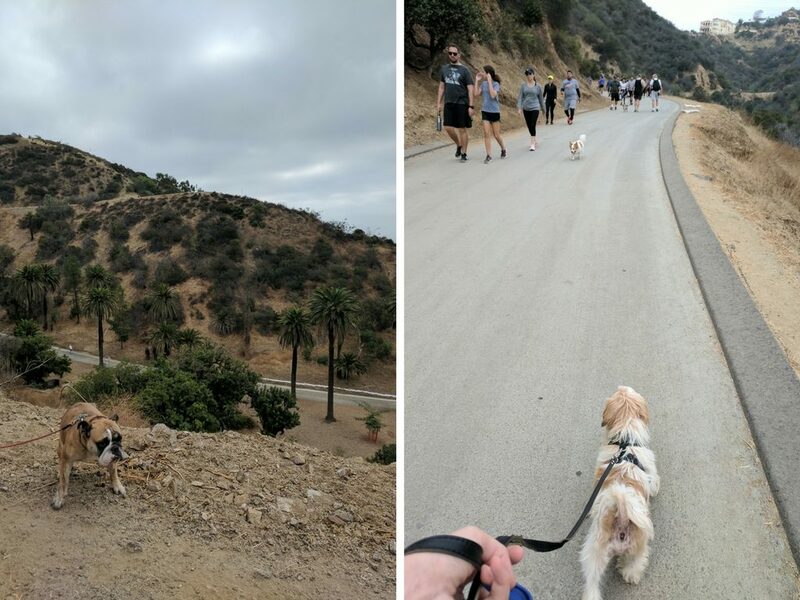 Hiking Runyon Canyon With Rescue Dogs…WTF? I know what you’re thinking. This sounds like pure heaven. Spoiler: it is. It was during a casual browse on Airbnb experiences ahead of my trip to LA that I found this gem of an outing. It’s run by a group called Free Animal Doctor, which is a non-profit animal welfare organisation that raises money for animals in need. 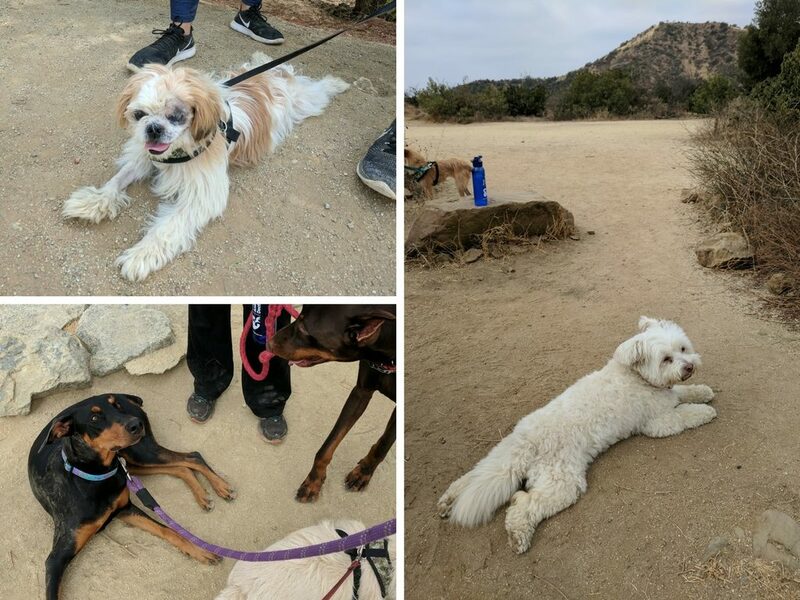 Several times a week, a selection of the pups are taken on a walk up Runyon Canyon for a) exercise, and b) socialising. The dogs you’ll meet will vary from walk to walk, depending on the weather, the size of the dogs, and many other factors. 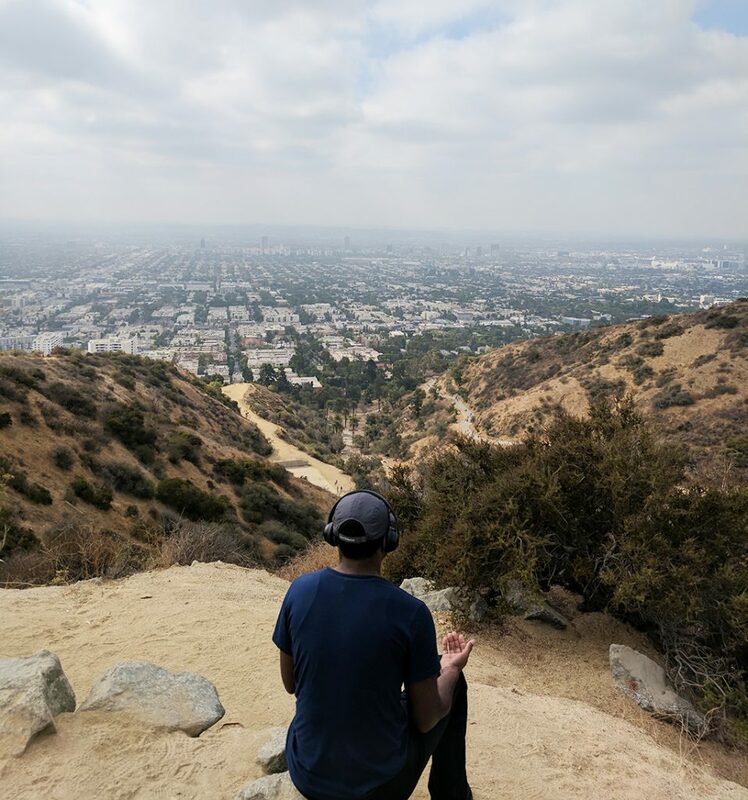 We scheduled our Runyon Canyon hike for the day after we landed. And guess what? It started at 9am. WEEPS. Early start aside, this was possibly the greatest thing we could have done for our jet lag, since it got us up nice and early, ready to take on the day. Our Uber driver dropped us off at the top of North Fuller Avenue (there are various entrances to the park, so make sure you get the right one! ), and then it was time to wait. Luckily, there was a stall of goods – complete with honesty box for donations – selling water, snacks and dog treats, so we spent some time fuelling up for the hike ahead. 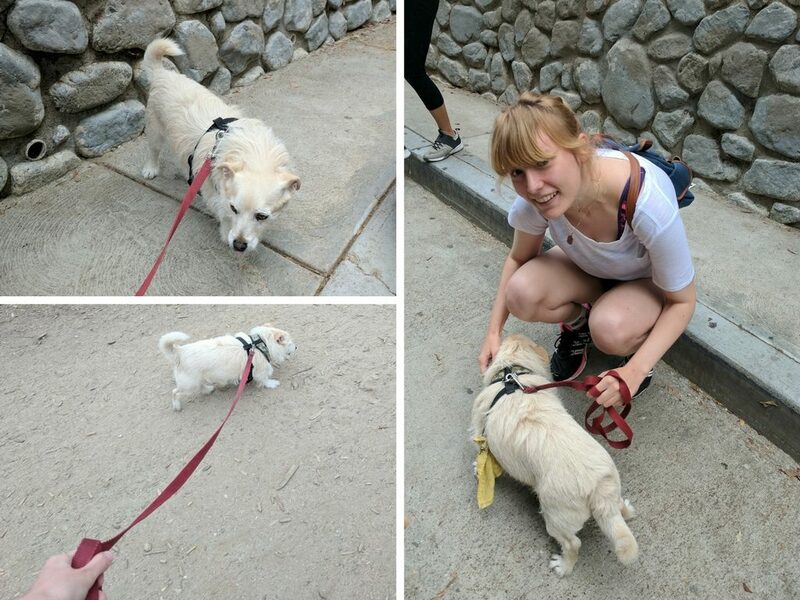 When the pups arrived, we were each handed a leash and told to get acquainted with our dog. Right off the bat I got Gordon, an elderly gent who loved frequent stops to catch his breath and have a sniff. It was love at first sight. After a welcome talk introducing all the dogs and the helpers, it was time to set off! One thing I was worried about before I started was just how hard the hike itself would be. I mean, I know I’m running 10ks now, but steep hills will forever be my arch nemesis. But, in fact, on the way up I barely broke a sweat. 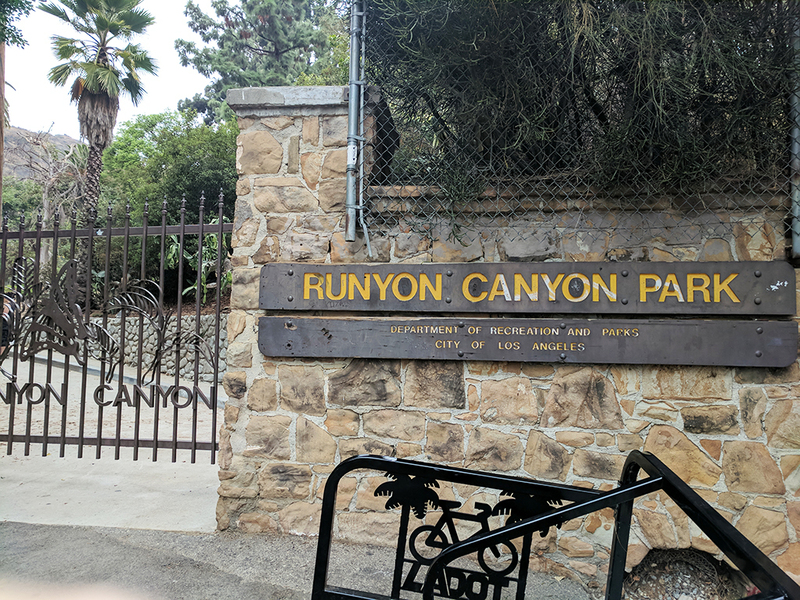 There are various Runyon Canyon hiking trails, and this is one of the easier ones you can do. Plus, you’ve got to remember that on this hike you’re on doggo time. If your dog wants to stop, have a poop, find its best mate, go and look at that precarious cliff edge, you’re going too. It also wasn’t completely unheard of for a dog to just sit down for a quick breather while everyone else just ambled on ahead. 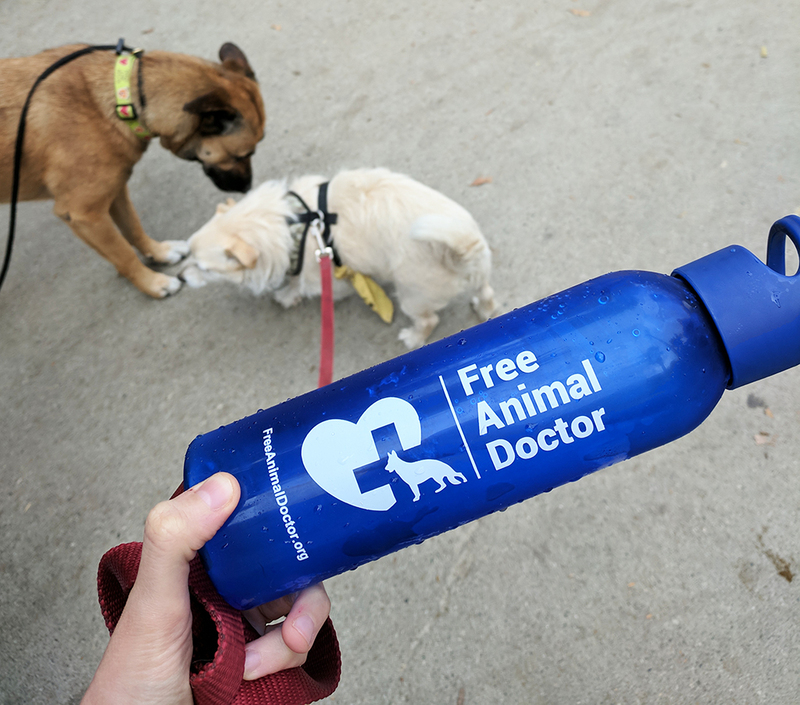 Frequent stops are also built into the hike for dogs to grab some water, you to refill your Free Animal Doctor water bottle (included as part of the walk), and for participants to swap dogs. Yeah, about that. You probably don’t want to get *too* attached to the dog you get at the beginning. Sometimes there are more people than there are dogs, so it’s all about sharing the love and making sure everyone gets a turn. 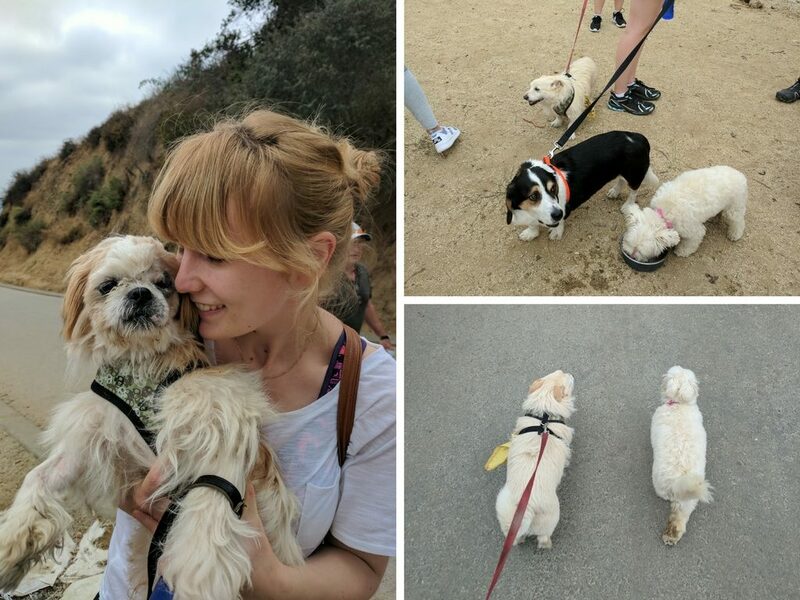 And the whole experience is also about getting the dogs used to meeting different people – after all, the aim of the game is to hopefully get these dogs adopted into a forever home, so it’s in their best interests to be people-friendly! While on the way up, I spoke to several Free Animal Doctor volunteers and could instantly tell these were some very special people whose lives were wrapped up in ensuring animal welfare. There was something very refreshing about being in this city which has (whether fairly or unfairly) gained a reputation for being all about the money, glitz and glamour, and listening to stories of people dashing halfway across the state to pick up an abandoned dog that had been spotted on the road. It was also so heartwarming to hear how they’d crowdfunded money for hundreds of life-changing operations, and giving so many animals a whole new lease of life. It definitely made me want to get a lot more active in animal welfare back home in London! The winding sandy pavement of the hike may begin to get a little weary after a while, especially when all you can see is the inside of the Canyon. But once you reach the top, that’s when the money shots appear. 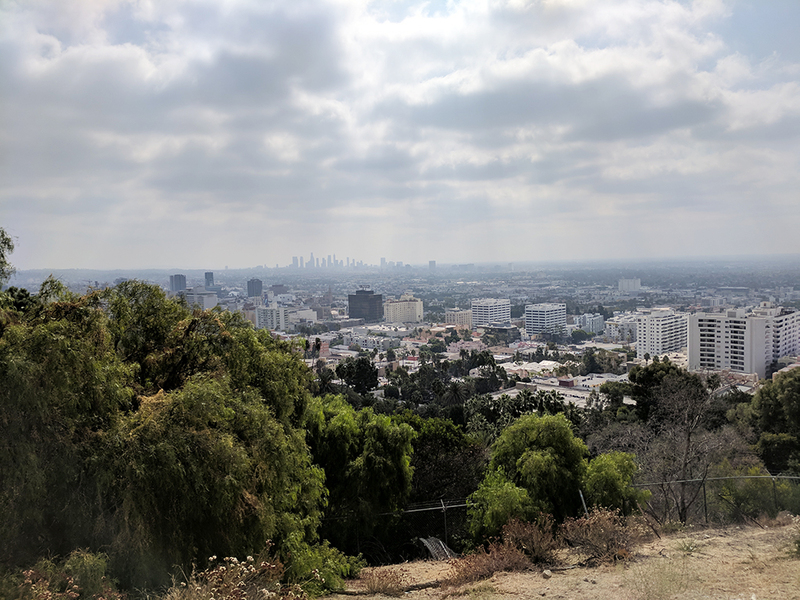 From one lookout point you can see the Hollywood sign in the background, and from another you’ve got the entire city stretching out in front of you. It’s not hard to see why people come up here for a bit of peace and quiet, away from all the craziness of the city. Once you’re at the top, there’s only one way down! I’d say the hike down requires a little more leg dexterity than the way up, especially since it starts with giant steps which are all too easy to trip over. Thankfully, I got down without too much of a bother, although some of the dogs needed a little bit of help navigating the steps, which was FAR TOO PRECIOUS FOR WORDS. The hike brings you back round to the iron gates where you first started. 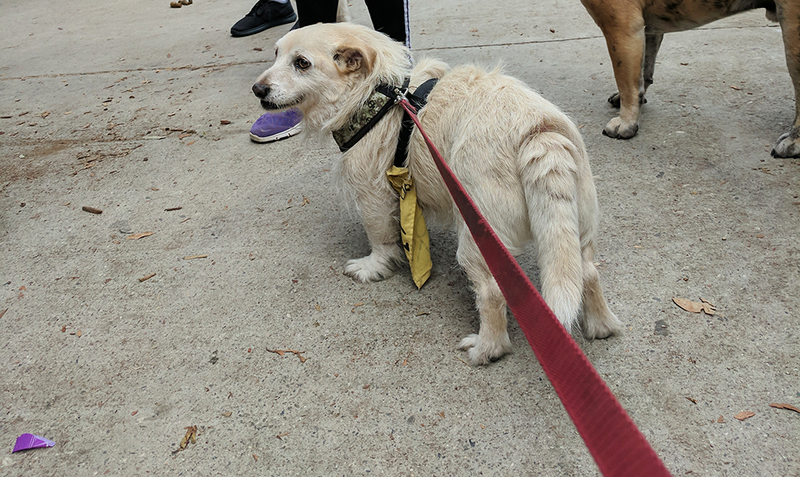 I was slightly hesitant to say goodbye to my boy Gordon (I may have even asked if it was possible to get him sent to the UK…unfortunately it’s not), as well as all the other dogs that I’d met on the hike. But as they hopped into the van ready to go home for some food and a nap, I felt that rare sensation that I’d done something good and fulfilling with my morning. As one of the organisers taught us, there’s a saying in LA – if the sky has enough blue to make a pair of jeans, it’s going to be a warm day. Or something to that effect. I went at the beginning of October when the weather was a little overcast but warm, although thankfully not overwhelmingly hot – think late teens/early 20 degrees celsius. During the hike, you’re entirely exposed to the elements (there’s nowhere to hide from the glaring sun), so you might want to dress accordingly with baseball caps, sunnies and suncream. Luckily, as the hike takes place so early you’ll most likely be spared the full hit of the hottest part of the day, but it’s still worth dressing lightly. For optimum comfort I chucked on my workout gear – sports bra, white t-shirt, running shorts and trainers – which really helped me get into that exercising mindset. Make sure you also bring a backpack with you to hold your camera/phone/money/water/snacks. The hike’s so much easier when you’ve got your hands free! There are no public toilets on the hike, so make sure you go beforehand! From the start/end point of the hike, it’s a 7-minute walk to Hollywood Boulevard, so it’s a good way to combine your sightseeing. 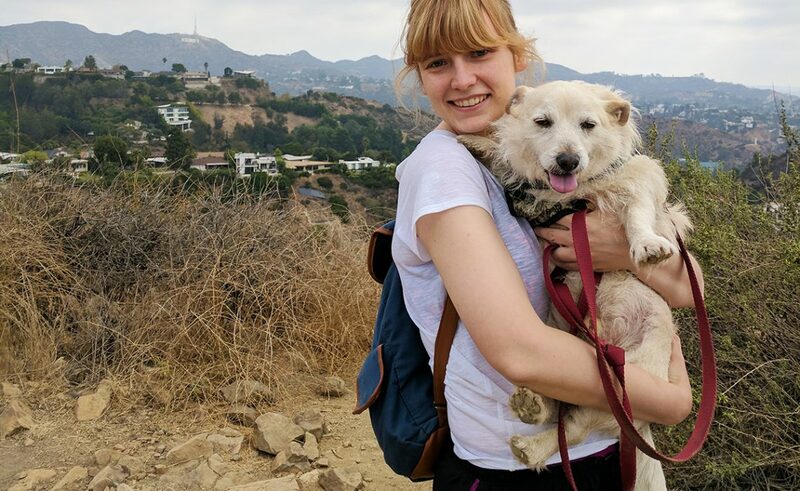 If you’re not in LA any time soon, you can still help out Free Animal Doctor. One way is to donate to many of the crowdfunding fundraisers on their site. Alternatively, you can sign up to Amazon Smile which donates – at no extra cost to you – 0.5% of the price of any eligible AmazonSmile purchases to the charity. 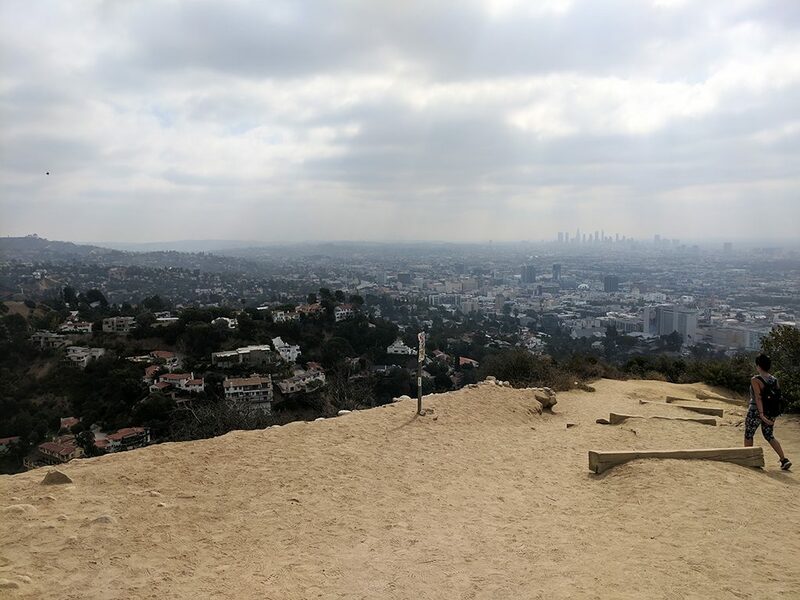 This two-hour Runyon Canyon experience costs £24 per person. Because this is a social impact experience, 100% of what you pay for the experience goes directly to Free Animal Doctor. So, not only are you getting a good workout, but you’re helping a fantastic cause while you’re at it.